George H.W. Bush's funeral will be the first such service for a former president since Gerald Ford was laid to rest in 2006. These ceremonies are an opportunity to see "what service to country actually looks like, to have a sense," Frank Sesno says. George H. W. Bush was, especially as measured by current standards, the kind of wholesome, uncontroversial figure most people would say they want in a national leader — until they got inside a voting booth. Then they might be swayed by political biases, ideology or even in some cases the historical record. Bush was, like every ambitious soul who has sought the power of national leadership, a mixed bag of qualities, personal and political, admirable and admonish-able. For the most part, mixed bag is not what people are reading and hearing about this week, as the national media focus on a state funeral for a former president. The lean toward positive in remembrances is all but baked-in when the nation is called on to pay respects for a prominent life recently completed. Beyond the official obituaries, with lists of accomplishments and encomiums from those who worked with him or competed against him, some of the most touching commentaries have come in the form of more personal eulogies from people like reporters who covered Bush and had interactions with him that went beyond the daily news coverage. Tom Boswell, The Washington Post sports columnist, wrote about a long-standing personal relationship based on fishing, and even advice about movies. 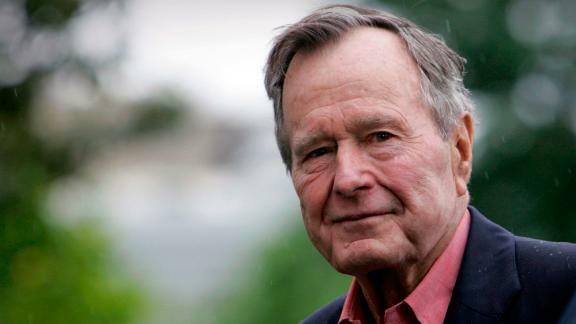 He praised Bush, saying his "gift for personal connection, naturalness and self-deprecating warmth was extraordinary." His ending was a remarkably vivid anecdote about Bush still having the first-baseman's mitt he used at Yale in a drawer in the Resolute Desk in the Oval Office. And a final observation: "I thought, then and now: 'What a fine man. And what a great country.'" Even more personal was an extraordinary column from my former New York Times colleague Maureen Dowd, in which she recounted her remarkable, three-decade-long personal relationship of mutual esteem with the former president. "Where do you and I stand? It is not hate (underlined). How can I feel a warm spot in my heart for someone who day in and day out brutalizes my son? I don't know but I do. End of Confession — Con Afecto, GB #41." "I reserve the right to whine, to not read, to use profanity, but if you ever get really hurt or if you ever get really down and need a shoulder to cry on or just need a friend — give me a call. I'll be there for you. I'll not let you down." Twitter was filled with appreciative messages about being affected by the column, but then there were also these: "Maybe normal people are just fed up with journalists who fetishize access and revise someone's record to whitewash them because they were personally nice to them in line once at Wendy's while they were waiting for a Frosty." And: "Did she title it, 'friends with a war criminal?'" Dowd called Bush "the most polite man who ever lived," and one response on Twitter was simply: "The most polite man? Willie Horton?" Dowd in fact did mention "the race-baiting Willie Horton campaign" in a graph about Bush not being perfect. It hardly diminished the overall portrait which emphasized the man's "decency and sweetness." That tone, and the mostly effusive coverage everywhere, stirred a pained outcry from those offended by what they described as blind hagiography. Chris Hooks, the Rolling Stone writer, denounced Bush as the last of the "patricians" who ruled America in the 20th Century: "When saccharine hagiography is permitted but not its counterbalancing opposite, the cumulative effect is 'lying.'" He cited a Politico piece by David Greenberg which accused Bush of putting "self-interest over principle." "The solemn ritual of converting political leaders into noble deities upon death — with media hagiography, collective reverence, and coerced suppression of criticism and evil acts — is creepy, nationalistic and toxic. The US does it worse than the Romans did." There is certainly justification in criticizing the excesses of the gushing testimonials, though at this point liberal critics of Greenwald might expect him to pipe up at a eulogy for Santa Claus, charging: "Who was this guy to decide which kids were naughty and which were nice?" The liberal case for a harsher assessment of President 41 includes denunciations for his original opposition to the Civil Rights Act, that ugly Willie Horton campaign ad, the appointment of Clarence Thomas to the seat once held by Thurgood Marshall, the willingness to risk leaving the country managed by the callow Dan Quayle, and the egregious pardons in the Iran-Contra mess. Should all those be accounted for in assessing Bush's overall record? For certain — and every responsible obit has done so. But in every prominent public life there is the judgment of history, and the judgment of family. The personal recollections of interaction with Bush deal with the common humanity he shared with the rest of us. He was part of the family of us fellow citizens. His generation and my parents' generation shared connections and common purposes that younger generations have an increasingly difficult time relating to. Bush, the patrician, went off to fight in a ferocious war against real evil when he was 18 — just like the vast majority of young men of his generation; just like my own Dad and uncles. He was, as several of the gushing testimonials have noted, the last US president to serve in combat. And it was combat that came within inches of taking his life. He did not assert some privilege to escape combat duty, as he likely could have given his wealth and status (and as some say his own son apparently did); nor did he find some useful bone-spurs equivalent, like fly-fisher or horseshoes elbow. Somewhere there is a point to be made about how serving in WWII conveyed a respect that the warriors of Vietnam were always denied. Both John McCain and John Kerry came close, but their combat heroism did not prove unassailable. That is the stuff that belongs not in obituaries, which are about what a person did, but in eulogies, which are about who a person was. It is completely legitimate to question an official obituary that seems to whitewash the public record of a public figure. It's not the same thing to heckle a eulogy from the pews, with shouts of "Nice guy? Sez who?" Thanks to all the rosy recollections now filling every corner of the media, the good that Bush did will indeed live after him, and not be interred with his bones. And that's a fine thing.